There are a lots of things to notice in term of SEO in because now-a-days there is no place of mistake in eye on Google. 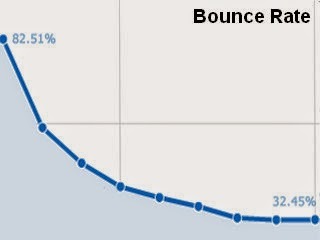 Now numbers of webmasters are thinking about how to reduce Bounce rate of website or blog. No doubt in that there are lots of challenges you will need to face if you want to see good bounce rate on your site. Now for that first of all you would need to understand all things deeply about bounce rate. This is some difficult but not impossible. When you will put efforts from your end then you can see huge benefit for you. I am going to share those all points which I had applied for my website and blog to reduce bounce rate, and after these factors I had reduce up to30% bounce rate which is biggest achievement. What is Bounce Rate in SEO: When a visitor leaves your website and blog without browsing any other webpage that is called Bounce Rate? Bounce rate commonly hurt to bloggers, news and publisher’s sites because visitors mostly come on landing page where they are get latest news and articles and after that they leave the website without browse any other webpage of site. 1. What to do: First of all you should check out your Google analytics account where you will know the bounce rate of your particular website or blog. 2. Visitors Interest: When visitors of your website and blog will stay for long time and they will go to on another pages of your website as well at that time bounce rate will be reduce which would be positive point for you. 3. Create landing page according to visitors: Think your website is generating good traffic but visitors are not getting useful things on that then it would be wrong. 4. For Example: Visitor wants to get information about “Courses on hotel management in Sydney” but on other hand your website’s landing page giving general information about hotel management courses then definitely visitor will bounce. So try to create that kind of webpages on your site which are visitors friendly. 5. User friendly Content: You should try to write that kind of content for your webpages which is tell number of things in short time. Like now-a-days no one would like to waste their time. Some readers could be still show their interest to read the content of your website but they don’t have enough time to read so they bookmark your page and try to read after some time, this activity could also increase the bounce rate. So here you can use the trick after written original and fresh content in less time. 6. Landing page should load fast: If your website has numbers of images, videos and pop-ups then you should check out the quality of them time to time. If these images, videos and pop-ups are taking much time to load then you should resolve this problem as soon as possible like you should reduce image’s size for best loading time of your website’s landing page. In the end I would like to highlight those some factors which can prove more harmful from bounce rate point of view. · Landing pages which can takes you to download page every time.